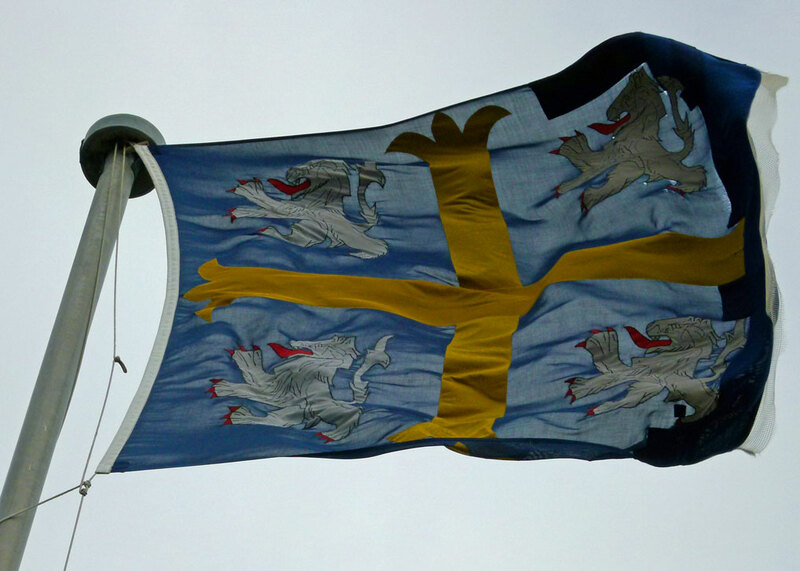 Durham’s story is a fascinating piece of the story of England. It is partly a tale of saints and kings and moving bones, and it begins back in the 7th century. Actually, it was mostly Cuthbert’s fault – with some help from the Danes, a lost cow and perhaps a bit of Divine Intervention. 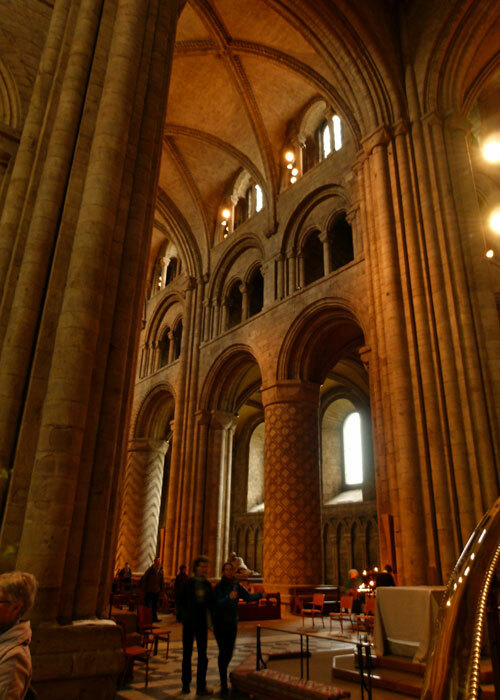 Without any one of these, Durham Cathedral, the mighty Cathedral Church of Christ, Blessed Mary the Virgin and St Cuthbert of Durham, and one of the most outstanding examples of medieval Norman Romanesque architecture in Europe, would never have been built; maybe. St Cuthbert is pretty much the patron saint of north-east England, as northern as Newcastle Brown Ale and kippers in Craster. He was probably Anglo-Saxon, born sometime in the 630s or 640s AD in what is now the Scottish borders, trained as a monk at Melrose, lived for 19 years as a hermit on the island of Inner Farne, was persuaded to become Bishop of Lindisfarne and died on 20th March 687AD. Even in life, Cuthbert was regarded as an exceptionally holy man and associated with miracles of wisdom and healing, which continued after his death. 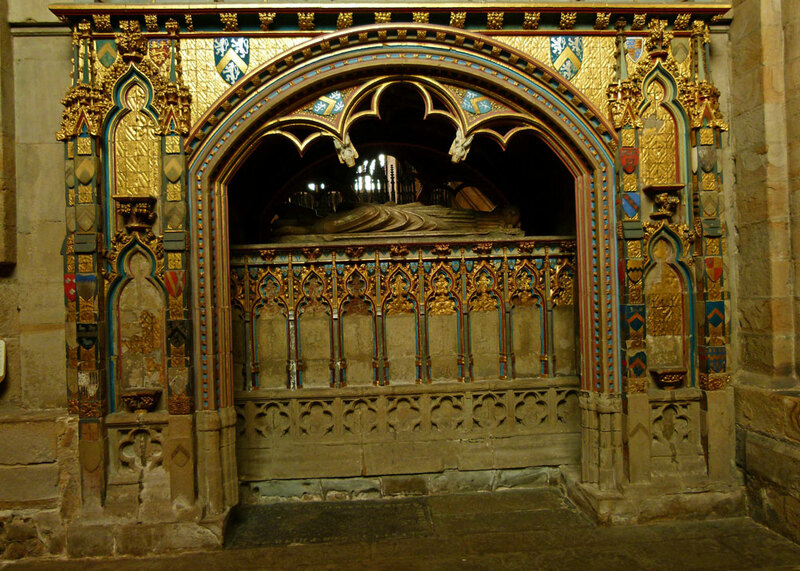 Eleven years after he died, Cuthbert’s brother monks exhumed his body in order to place it in a new coffin above ground where the saint could be better venerated. They were astonished to find his body as fresh as a daisy, as though he was merely asleep. Needless to say, this news provided a considerable fillip to the already established cult of St Cuthbert and encouraged the pilgrims no end. Pilgrims, then as now, can be good business. In 793 came the first Viking Dane raid on the Holy Island of Lindisfarne. The raids continued and some Danes began to put down roots in the area. By 875AD, the monks had had enough and decided to abandon their home. 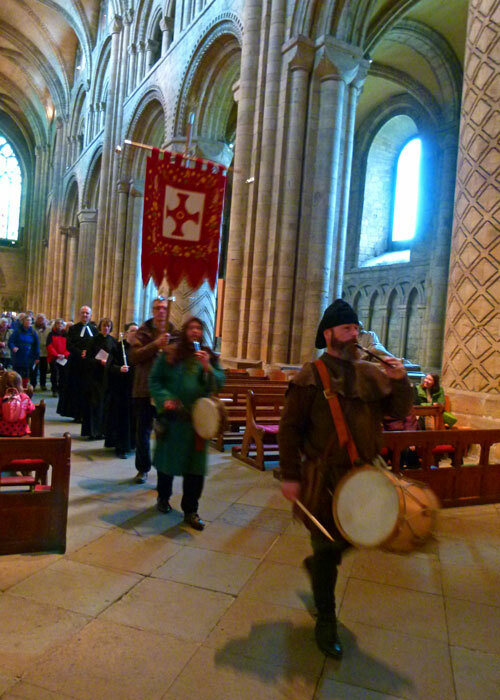 Taking their remaining precious treasures with them, including the Lindisfarne Gospels and Cuthbert’s body, for seven years the monks wandered the length and longth of Northern Britain, seeking a suitable place to rest their weary bones (and Cuthbert’s). They eventually found sanctuary near the site of the old Roman fort at Chester-le-Street, staying there for more than a century until, in 995, the threat of further Danish raids forced them to move, temporarily, to Ripon. Returning from there, the cart carrying St Cuthbert stuck fast and would not move. The saint appeared in a vision to the monks’ leader, Bishop Ealdhun (or Aldhun), saying that where he really wanted to go to was a place called Dunholme – which no one had ever heard of. As the monks were puzzling over this, a cow-girl came by and asked another maid (who also happened to be there) if she had seen her lost dun cow. Yes, replied the second girl, she had seen it heading in the direction of Dunholme – and pointed the way. At this, Cuthbert’s cart moved off easily and the monks followed the cow-girl to a mighty wooded crag towering over a loop in the River Wear. Here, the girl found her missing cow and the monks constructed a wooden church to house St Cuthbert and built their community around it. There is a Dun Cow Lane near the cathedral today, and an 18th century carved panel depicting the two girls and a cow on the cathedral’s north side. An alternative, far less enjoyable, explanation for founding a community at Durham was that Ealdhun’s daughter, Ecgfrida, was betrothed to Uchtred (or Uhtred) the Bold, son of Waltheof of Bamburgh. 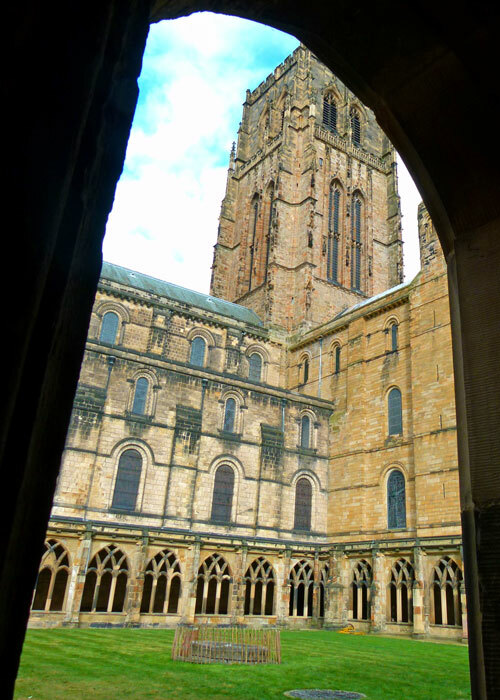 Durham’s lofty and defensible position offered the prospect of greater safety for the holy community, as well as the protection of the Bishop’s son-in-law – whose men apparently helped the monks clear the ground for building. From Uchtred’s perspective, the presence of St Cuthbert would add a celebrity cachet to the place and do something for local tourism. The first church at Durham was probably timber framed with wattle and daub walls. Whitewashed, it was known as Alba Ecclesia, the White Church. Just three years later, the monks moved Cuthbert to a new and larger church, probably built in stone. 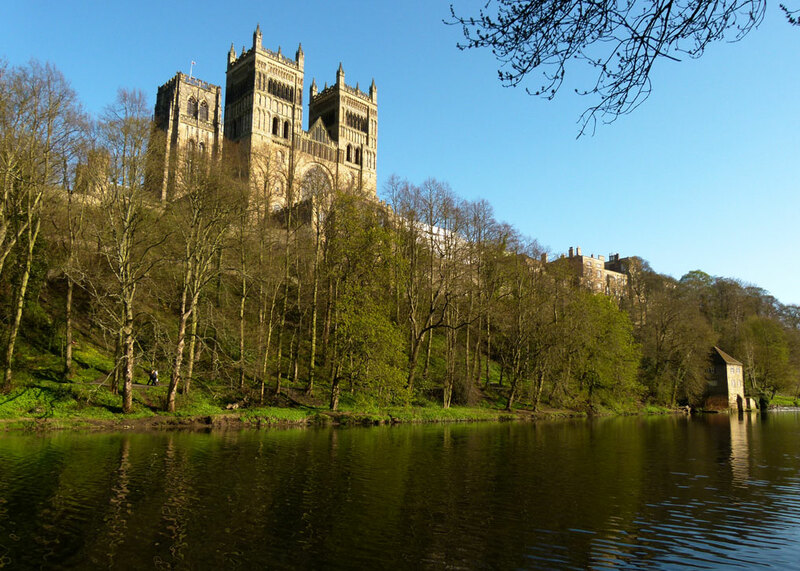 Unsurprisingly, the cult of Cuthbert ensured that Durham became a place of pilgrimage, and the town grew up around the monastic community. It also had strategic importance, which William the Conqueror recognised as he took stock of his new kingdom following the Norman victory at Hastings in 1066. In 1072, he ordered the construction of a castle at Durham, as a base both to help control restless English rebels and to defend his territory against marauding Scots. And in 1075, William appointed the Bishop of Durham ‘Prince-Bishop’, a title which bestowed an enormous amount of power, including the right to raise an army, levy taxes and mint coins – provided always that the bishops maintained their loyalty to the King of England and protected the northern border with Scotland. The first Prince Bishop was Walcher of Lotharingia (a province corresponding with parts of modern Holland, Belgium, France and Germany), but he was murdered in 1081 and William replaced him with a Norman, William de St Calais, or William Carileph. It was Bishop Carileph who begun the construction of the new, Norman, cathedral in 1093, which was substantially completed by 1133. The Galilee Chapel was added in 1175, the two western towers between 1217 and 1226 and the Gothic Chapel of the Nine Altars was completed between 1242 and 1280. 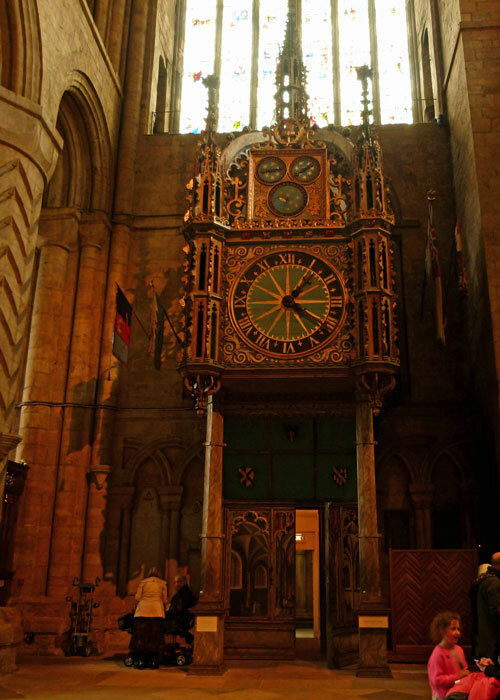 In 1104, Cuthbert was brought into the new cathedral and placed in a marble shrine, studded with jewels and semi-precious stones. Of course, the opportunity was taken to see how the saint was faring after all this time – and, inevitably, it was again reported that he looked exactly the same as he had 400 years earlier. More astonishingly, a small book of the Gospel of St John was recovered from his coffin. The book was probably made just after Cuthbert’s death and, known as the ‘St Cuthbert Gospel’, is now in the British Library still in its original, Anglo-Saxon, binding. It measures just 3½ x 5½ inches (92mm x 138mm) and was formerly known as the Stonyhurst Gospel, after the Jesuit school in Lancashire which owned it for about 500 years. Cuthbert’s shrine was destroyed in 1539 when the Reformation came to Durham but, surprisingly, the saint’s remains managed to survive – despite one story that his coffin was smashed by a sledgehammer. 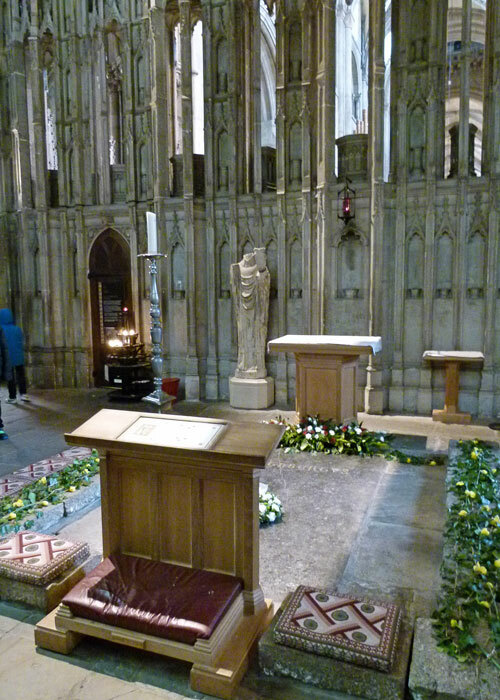 There is a legend that Cuthbert’s body was removed to a secret location for safe keeping to escape Henry VIII’s men, and replaced with that of a (dead) common, or garden, monk; but received wisdom is that Cuthbert is still interred in his present location behind the High Altar, beneath a marble slab marked CUTHBERTUS placed there in 1542. The poor chap’s bones were disturbed again in 1827 when various relics were removed from his tomb, including some 10th century vestments and the remains of his original coffin – which has been painstakingly reconstructed and is now held as a treasure by Durham Cathedral. So we need to mention Oswald’s head. Oswald is another local hero and saint. He was the Christian victor of the Battle of Heavenfield (c634AD), Anglo-Saxon King of Northumbria, who set about unifying his people and gave Lindisfarne to Aiden, who in turn founded the monastery there and is known as ‘the Apostle of Northumbria’ for spreading Christianity in the kingdom. However, it was Oswald who instigated Aiden’s arrival in the first place and, because Aiden was a Celt who spoke little Anglo-Saxon, the king acted as his translator. Oswald fell fighting King Penda of Mercia at the Battle of Maserfield in c642, thought by many to be Oswestry in Shropshire (Oswestry means ‘Oswald’s tree’). After the battle, Oswald’s body was dismembered and his head somehow made its way to Lindisfarne and thence to Durham, where it was buried with Cuthbert. And, apparently, it is still there. As if the bones of Cuthbert and the skull of Oswald weren’t sufficient, Durham Cathedral is also the final resting place for Bede, aka the Venerable or the Venomous, depending on your inclination and sense of humour. 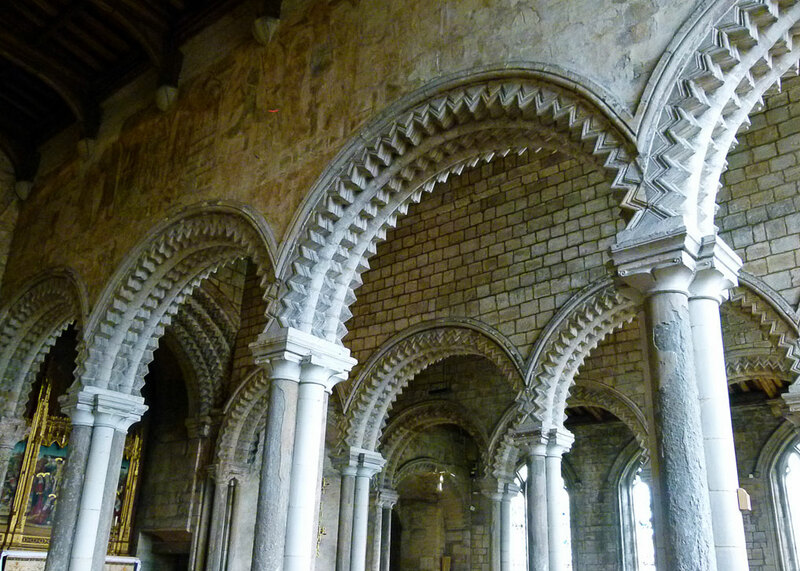 Bede was born around 673AD, died in 735AD and spent almost his entire life from the age of 7 at the twin monasteries of St Peter and St Paul at Monkwearmouth-Jarrow, Tyne and Wear. However, Bede’s reputation is not as a monk but as a scholar and, most famously, for his Historia ecclesiastica gentis Anglorum, The Ecclesiastical History of the English People. I can still picture my history professor, a man seemingly far removed from life’s realities, and not easy to like, eyes partly closed, hands together as if in prayer, discussing Bede in his very precise, mid-European accented English. I think he truly venerated this long-dead cleric, one academic to another as it were. Indeed, I have a grudging affection for old Bede myself – for where would our knowledge of pre-conquest Britain be without him? His History covers the period from Julius Caesar’s invasion of 55BC to 731AD and it is a fascinating, often amusing, if hardly fast-paced, read. Leave aside any scepticism you may have about miracles and the supernatural, appreciate Bede’s bias and role as a propagandist for the Church of Rome (the clue’s in the work’s title) and realise that, for all its potential pitfalls, this is one of the few primary sources we have for the period. Only a small minority would begrudge Bede being referred to as ‘the father of English history’ – though, in truth, his work offers an insight on the whole island. Bede was originally buried at Jarrow but, for some reason, his remains were brought to Durham in 1022 by a monk called Alfred and buried with Cuthbert. I read in one source that Alfred actually stole the bones and that they were only discovered when Cuthbert was moved in 1104. 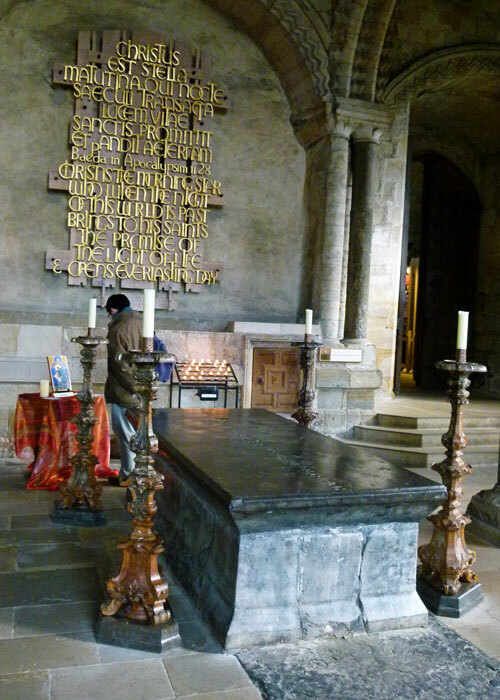 Bede himself was relocated to the Cathedral’s Galilee Chapel in the 14th century, and remains there, but he was disturbed during the Reformation and again in 1831 when his tomb was excavated and three plaster casts taken of his skull. Approaching Durham Cathedral and Castle from the medieval Framwellgate Bridge, it is easy to appreciate its dominant position high on the crag above the River Wear. It’s impressive enough now; centuries ago, it must have been mind-boggling. The name makes sense, too; the Dunholme of the Middle Ages comes from old English dun, meaning hill, and old Scandinavian holmr, meaning island or raised land. Up the hill and past what were once medieval defences and you enter the complex onto Palace Green, which would once have been a bustling place between the castle and cathedral, but which is now mainly used on high days and holidays. The streets around follow, and in places incorporate, the old bailey walls that once encircled the entire peninsula. 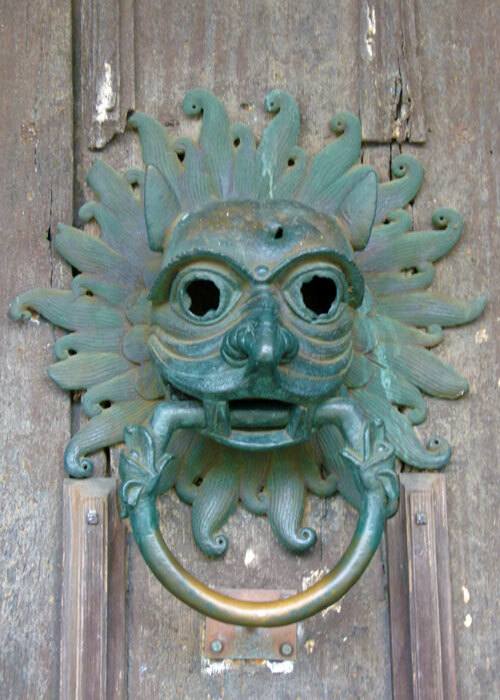 On the main, north door, to the Cathedral is the sanctuary knocker (actually, a replica) – the ancient privilege of sanctuary granted criminals and others in trouble refuge for up to 37 days, during which time they either needed to work things out with their adversaries, or plan their escape. The right of sanctuary was abolished in 1624. 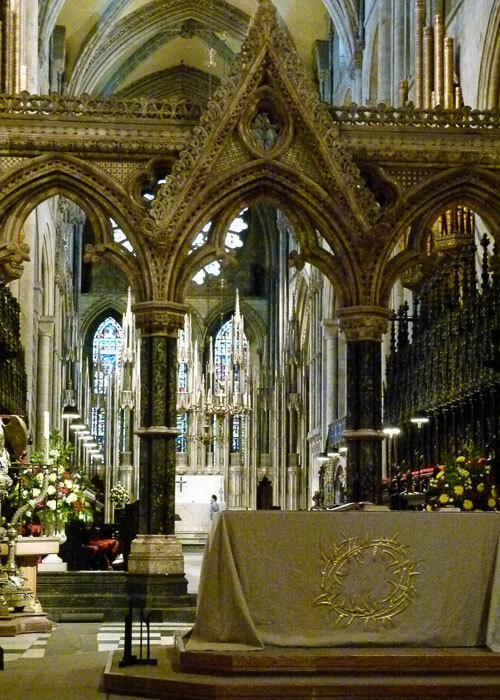 Beyond is the Neville Screen, which separates the nave from the quire. A gift from one of the most powerful local families in the middle ages, the screen is a masterpiece of medieval sculpture, made in London, transported in sections and assembled on site in 1380. 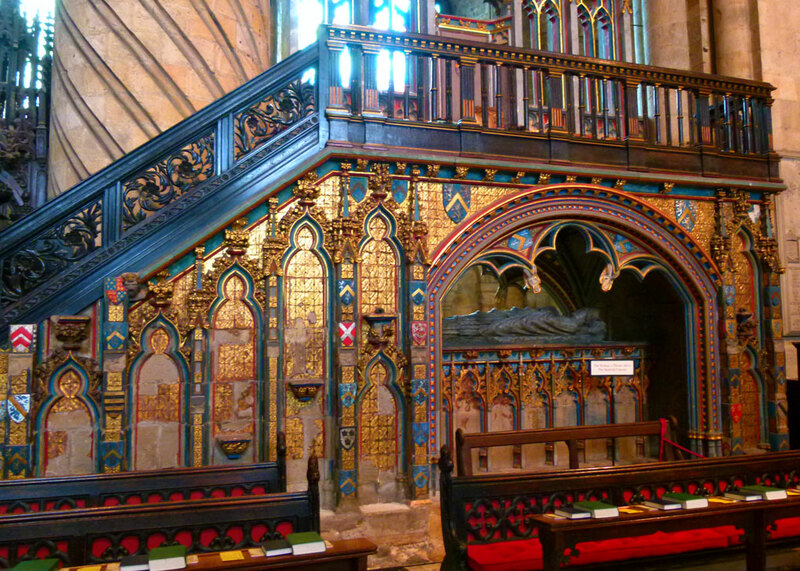 It once held 107 statues, hidden for safety during the Reformation and not yet found; like the rest of the church, the screen would have been colourfully painted. 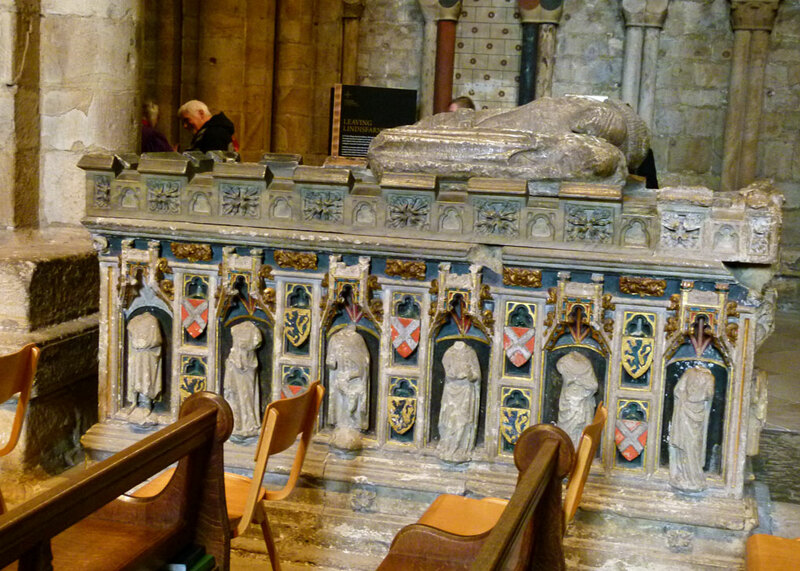 The tombs of John Neville (1337-1388), 3rd Baron Raby, and his wife, Maud, and that of Bishop Thomas Hatfield (died 1381) give an idea of what medieval decoration would have been like. Hatfield founded Trinity College, Oxford and built a bishop’s throne, in its day claimed to be the highest in Christendom, over the small chapel next to his tomb. The damage to John Neville’s tomb was caused by Scots prisoners of war, held captive in appalling conditions in the cathedral after Cromwell’s victory at the Battle of Dunbar in 1650. 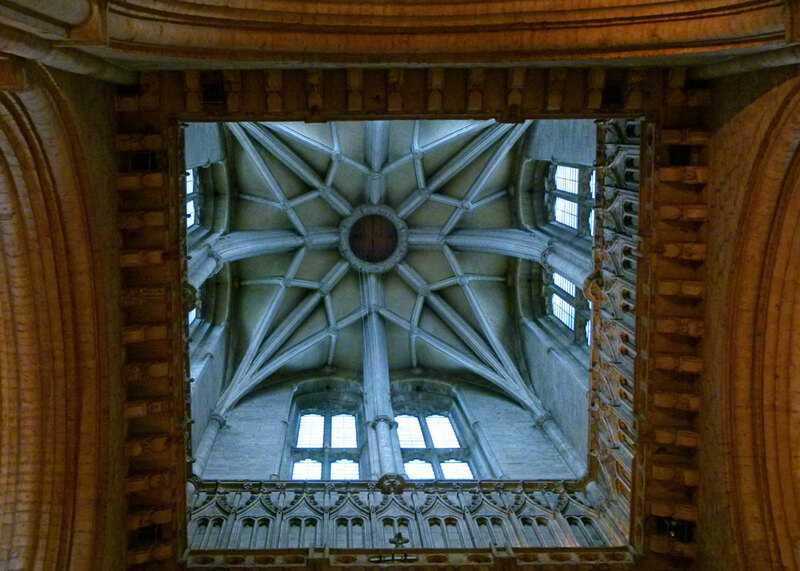 John Neville’s father, Ralph, who fought the Scots a little earlier, at the nearby Battle of Neville’s Cross in 1346, and who captured King David, is also buried in the Cathedral. Other notable burials include the bishops Ranulf Flambard (c1060 – 1128), who had an illustrious career under both William I and William II (Rufus); and Antony Bek (c1245 – 1311), a powerful advisor and ally for Edward I. The Galilee Chapel where Bede is interred is also known as the Lady Chapel – once the only part of the cathedral where women were tolerated. I’m not sure whether this was because of a local rule of the Benedictine monks at Durham, or because legend had it that Cuthbert didn’t like women (so he wasn’t so great, after all, then). Apparently, Queen Philippa, wife of Edward III, was forced to sleep in the castle, rather than in the monastery guest rooms, so that St Cuthbert wouldn’t be upset. The architecture in the Galilee Chapel is different though – built later than the main church, the columns are delicate – almost flimsy. High on the walls are the remains of 12th century paintings. 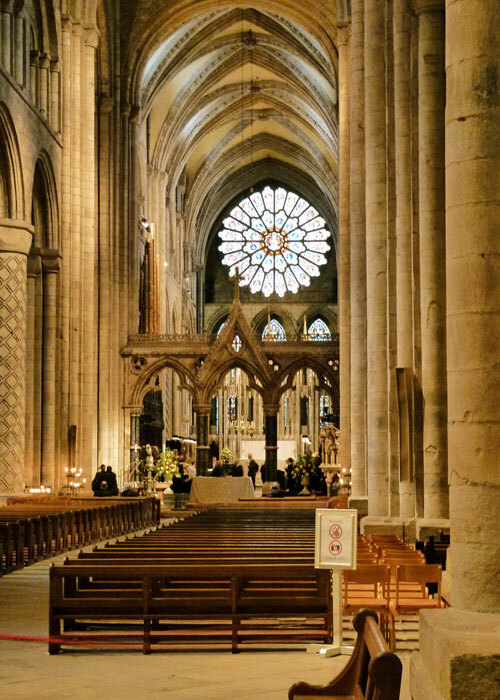 Durham Cathedral is one of the world’s great cathedrals, and full of historical treasures – many of which are exhibited. 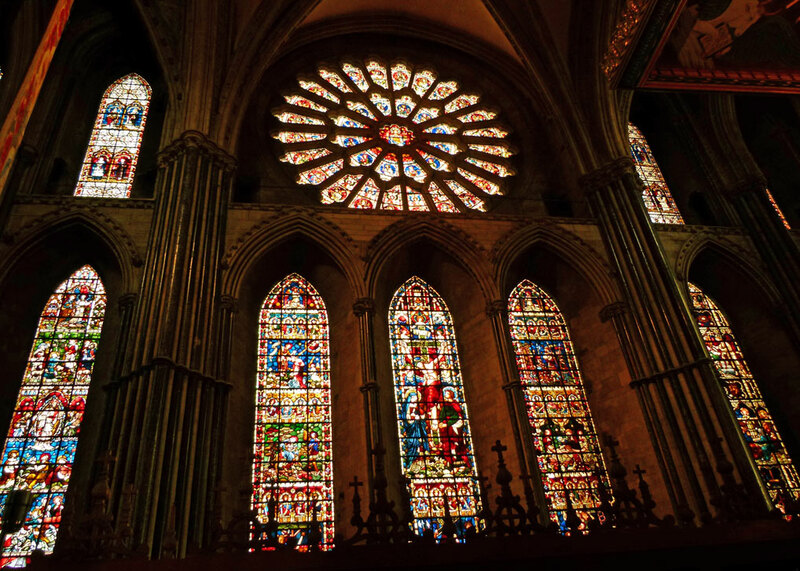 Not only does the Cathedral hold the remaining bits of St Cuthbert, St Oswald and the Venerable Bede; it has an impressive collection of other unique artefacts (including the original sanctuary knocker), early printed books and three copies of the Magna Carta. Wandering around, you get a distinct sense of power – both spiritual and temporal – and the long history of the place. 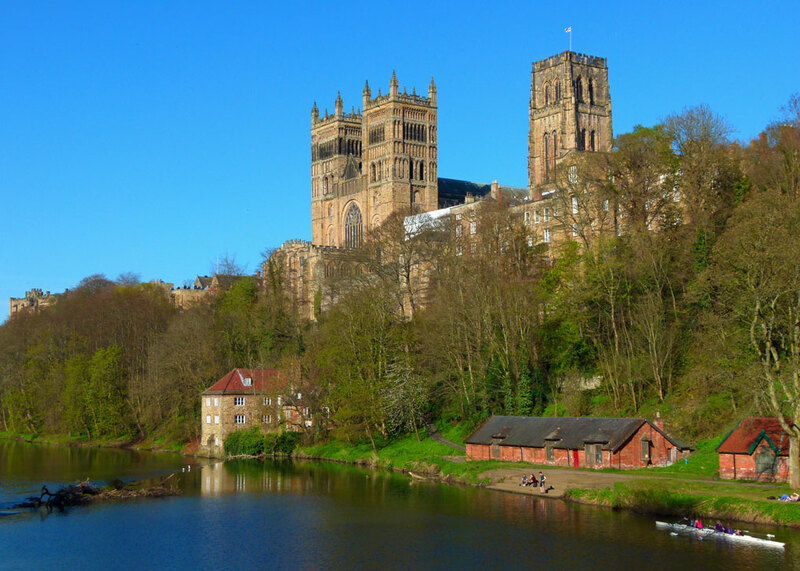 For me, though, Durham belongs to Cuthbert and Bede and is a tangible link with the early medieval, pre-conquest, Anglo-Saxon, land of our ancestors. 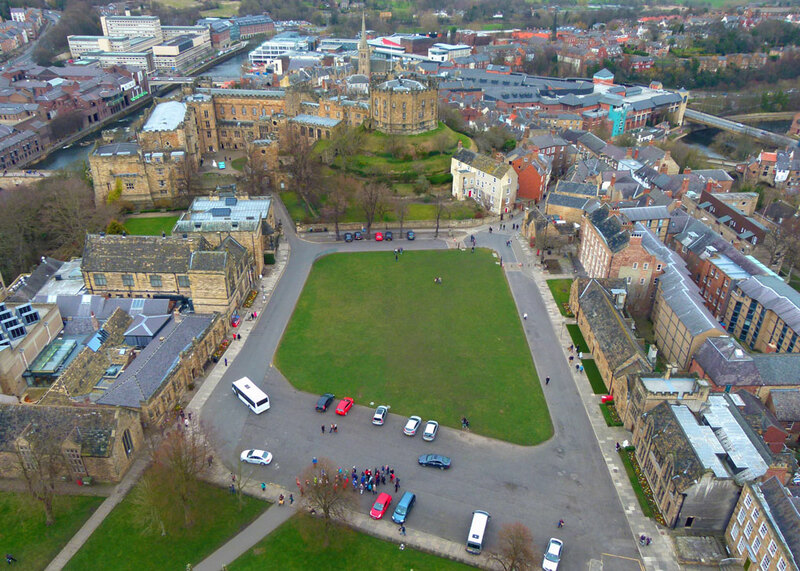 A more recent claim to fame is Durham Cathedral’s use as a film set, including the first two Harry Potter movies, Harry Potter and the Philosopher’s Stone (Sorcerer’s Stone in the US) and Harry Potter and the Chamber of Secrets, when parts of it became Hogwarts School. The cloisters and quadrangle were used in various scenes, not least for a bit of quidditch practice, and the chapter house was turned into Professor McGonagall’s classroom. My last visit to Durham Cathedral was even more of an adventure than using a portkey or floo powder, however. The Memsahib and I had arranged to meet up with the lovely and erudite Judy, who runs the excellent Cranberry Morning blog and also sells wonderful home-made soap. She was accompanied by the charming and equally erudite Mr Cranberry and they in turn introduced us to James, from J_on_tour, who writes interestingly of his travels and illustrates his prose with first-class photographs. The Cranberries were visiting from Wisconsin (also famous for its cheese); James was a little more local. We felt a little trepidation, driving across the Pennines to meet people we only knew through the ether; perhaps a little like an internet date, but with less after-shave and fewer potential complications. In the event, it was as though we had known one another for years. And, if you haven’t already visited Cranberry Morning or J_on_tour, then you should. I appreciate all the details about Cuthbert and the cathedral, in your pleasing prose that truly gives just enough context to reveal the subjects as worthy of more study or exploration when one “has time.” And yes, you certainly make me want to return to Britain and Durham now that I would visit as a pilgrim myself. Because Cuthbert lived before the East-West Schism of the church, he is a saint who belongs to us Eastern Orthodox as well. Thank you! I’m impressed that you keep a journal – I’m not that organised! It’s in a nice position beside the river. Funny how you can travel all over the UK and can work out where you are,roughly speaking, by just knowing the local saints. They seem to have each carved out their own small square of territory in a clearly defined patchwork quilt of religious Britain. 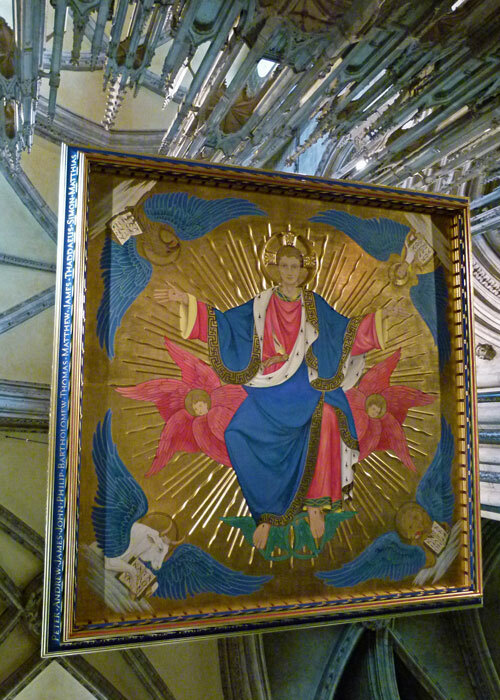 Interesting idea for a blog – saints of the UK! It is always a pleasure to learn more about your wonderful country’s historical gems thanks to you Mike! What a rich story and post! One of my treasures from the Olde Country, now hanging on my living room/lounge wall, is a painting of Durham Cathedral. The view is from across the river, just a bit downriver, I think, from the view you have here. Oil or acrylic on a rough canvas. It cost me about $10 at a car boot in Birmingham and cost about £30 to ship it across the big pond, frame and all!! Glad my cousin was available to pack it up for the post! Your photographs are perfect! Now to look up Cranberry Morning. Cheers….. I agree – A Bit About Britain is a project without end! I’ve not visited it … yet! Once again a very informative post and a great selection of photo’s. Another on my list of places to visit, I really should make an effort to go. Stunning photos and lovely history. What a pleasure to read about the history and see such exceptionally lovely photos. As an armchair traveler I find myself making notes about places to visit when I can finally get myself across the Atlantic. Thank you for the links to Cranberry Morning and J on Tour, I have them bookmarked and intend to peruse those sites later today. Durham’s a fascinating old city all round. It’s been a few years since I went there though. Maybe it’s time for a return trip. Beautiful. Reminds me of a combination of Notre Dame and Sydney Uni. Though just a tad grander than Sydney Uni. Wow! What a place! And I thought Westminster Abbey was grand. This is a must see some day. Nice to hear you met up with a fellow blogger, too. We did that in 2014 when we met Marie of After60theNext10 in London for breakfast. To be fair, Marcia, it is hard to beat Westminster Abbey for ‘grand’ and ‘wow’. But Durham has a different, unique, feel – its own special personality. Although I doubt I’ll ever make it to Durham, this made for a very interesting and entertaining after-work-cup-of-tea read before I’ll start on the ironing. Thank you! Just a short train ride next time you’re in Yorkshire… It’s my mission to show you other parts of the country! Even today, it is beautiful. One of the copies of the Magna Carta from there was on display here last year. I think several went on tour! This cathedral has been on my to visit list for a long time. Your post moved it even further. Love to see the Venable one even if he wouldn’t want to see me. It has to be done, Janet! Thanks for that magnificent piece. Lowering the tone, but I had a friend who was married in the Cathedral and another friend who was a cricket loving worshipper there who, apparently, spent long moments of thought as to whether the nave would ‘take spin’ Perhaps there was that coir matting in place. Thanks, Lesley. Wonderful, though slightly irreverent, picture! I’m sure there’s been a lot of spin of one sort or another coming from the pulpit over the years anyway. I think I need to stop reading your blog because I keep adding names to my “places to visit someday” list after each post… Or I should come & live in England. We could do with your help making some of run-down properties look nicer, Magali! And all because of a cowgirl. That has such an American ring to it. But it was a good thing they moved on from Ripon with Cuthbert’s bones. I don’t remember the exact years, so I am not sure when Wilfrid founded Ripon cathedral, but it’s nice to spread the saints around a bit. Anyway, another interesting post, and the big draw being Cuthbert and Bede, the area of the nine altars, the Galilee Chapel, those massive columns… almost overshadows the shootings of Inspector George Gently and D.S. Bacchus. I’m glad you weren’t repulsed by the American tourists. I hear they greatly enjoyed your company and attending Evensong with you and Mrs. B.